Chamilia presents this beautiful Eternity stacking ring! 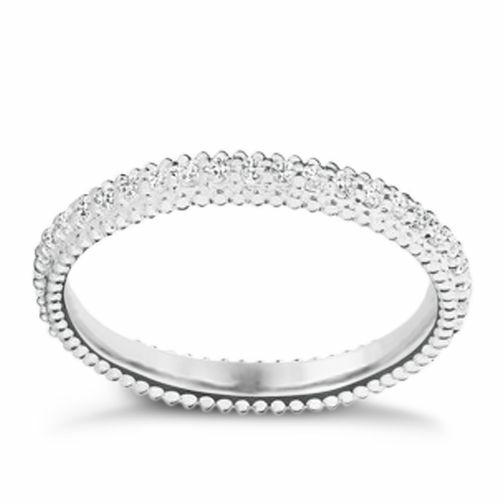 Crafted from sleek sterling silver, this band style ring is set with a row of shimmering White Swarovski Crystals for stunning sparkle and is finished with milgrain beading. Wear alone or stack them high, create a style that's totally unique and be inspired with Chamilia stacking rings. Size XL. Chamilia Swarovski ZirconiaEternity Stacking Ring XL is rated 4.0 out of 5 by 1. Rated 4 out of 5 by Anonymous from Beautiful classy stacking ring amazing price Extremely happy with my ring. It's beautiful, classy and looks great all stacked up. The staff were excellent when I went to collect it. They gave me brilliant advice. The only reason I gave 4/5 is because there weren't a great deal of sizes available. Would 100% buy again!